The African trypanosome Trypanosoma brucei is a single celled organism which causes African Sleeping sickness in humans. 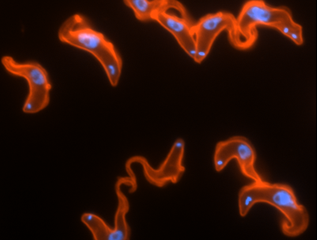 African trypanosomes multiply extracellularly in the bloodstream of the mammalian host, where they are exposed to continuous immune attack. Key to their survival is a sophisticated strategy of antigenic variation of a dense Variant Surface Glycoprotein (VSG) coat. An individual trypanosome has many hundreds of VSG genes, of which only one is expressed at a time. 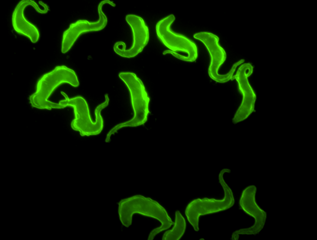 As within a population VSG switch variants are continuously produced, trypanosomes can remain one step ahead of the host and maintain a chronic infection. Our group is investigating molecular mechanisms of immune evasion including how VSGs are monoallelically expressed and switched. 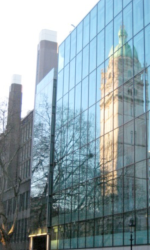 View Gloria Rudenko's recent collaboration with Facultimedia.net, please click on the icon below to see the video.